Printed from http://www.bodytalksystem.com//learn/news/article.cfm?id=1031 on Apr 22, 2019. Now that the sun has set on our 2017 IBA Members Conference and we have all had the chance to rest and integrate our experiences a little, it feels like time to reflect on the many wonderful moments we shared in the name of Heart and Soul. For those of you in attendance, consider this reminiscing. For those of you who couldn't attend, we hope you enjoy this peek into a very special event. The person who immediately comes to mind when reflecting back on Conference is Ben Manalo, our Conference Host, who effortlessly ushered along the speakers and events with such eloquence, naturalness and passion. We received so many comments on how he was the perfect choice for this year's theme. We couldn't agree more. On Friday morning, after our COO Paul Clayson updated our Membership on some positive changes coming up in the future, we were wowed by Tracey Clark's presentation on how observation alone can be a powerful catalyst for shifts to occur within clients. Her presentation spurred many a conversation over the lunch break. As BodyTalkers, we know that observing the formula unfold in a session is the "magic" of BodyTalk, but we don't often talk about how truly being with the client before their session even starts and being aware of their healing potential is a stimulus for change in and of itself. This seemed to make a lot of Members ask themselves "Hmmm, what are we actually DOING in BodyTalk?" That first afternoon we were all charmed by Howard Martin's (of HeartMath) laidback Southern attitude and drawl. And who could forget his infectious laugh? The work HeartMath has done and continues to do is truly incredible, and what a gift that Howard gave us all some very simple techniques to "raise our frequency." Howard and John are aiming to keep the lines of communication and collaboration open for the future. One of our favorite stories from Howard's presentation was how the dog Mabel chose to come live with him when her original home was in a state of disruption. It seemed pretty clear that any person or animal would be drawn to Howard's openness and full heart. Paola Novaes Ramos offered a brilliant start to Saturday morning. The wisdom she shared on both crystals and the family soul was both new and profoundly useful information for many BodyTalk practitioners. We're pretty sure that everyone, even those on livestream, could feel a very special energy from Paola and all those crystals on stage. And none of us will forget any time soon the powerful Cardinal Method constellation session she performed with John. It left both those in-person and on livestream quite speechless. Paola's session was followed up by the ever gentle, humble and endearing James Oschman. With his under-stated sense of humor and true openness to information and energy in its myriad forms, James gave a very insightful and thought-provoking presentation. He is always adept at tying together the most cutting-edge theories and research in a way that we can easily understand. As he said himself, he likes preparing presentations because it's like putting a puzzle together, bringing many pieces of separate information together to create a big picture. He called himself a "fitter-togetherer." Brilliant. Saturday night was the Myths and Monsters party. We were utterly thrilled by how many people dressed up. The costumes were all so well thought out, clever and unique, and no one shied away from dancing and having plenty of fun. We had everyone from Phyllis Diller (Fonda Hall's homage to the crazy-and-doesn't-give-a-hoot side of her personality) to a bloody Andy Spencer in the role of a Gladiator (who later had a hard time getting all the red out of his beard). (Photo courtesy of Andy; from left to right, Karen Best, Holly Steflick, Andy, Marcio Ribeiro, Ingla Cunha Faulstich.) 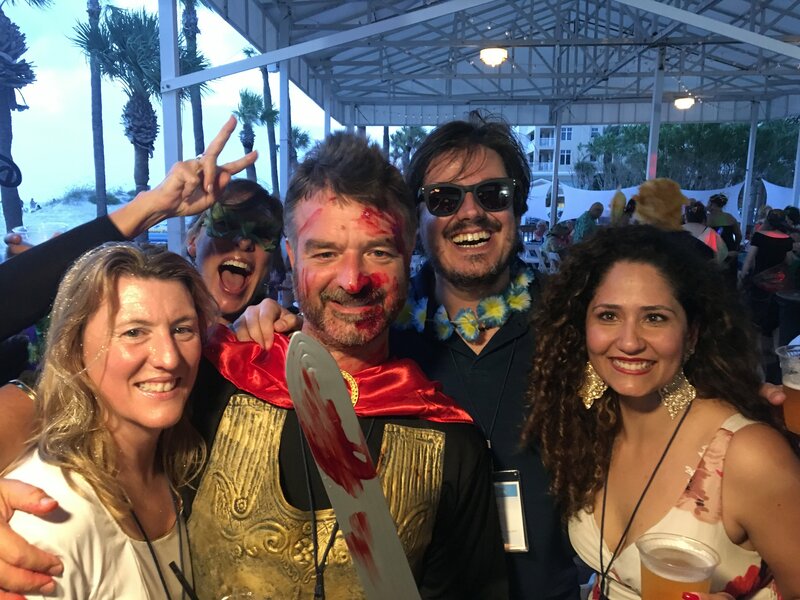 To see our costume contest winners and other photos from the party, read the full Conference Recap Newsletter HERE. Sunday morning began with the enthusiastic, story-telling and joke-loving Charles Krebs. A true scientist in every sense of the word, Charles' own journey and curiosity has stemmed from an ongoing interest in how we as humans learn. Charles' personal story of nearly dying in a scuba diving accident and then learning to walk again after receiving a life-sentence of quadriplegia clearly fuels his continuing drive to test the limits of both medical and alternative knowledge and research. Exploring the processes of thinking, stress and the subsequent connections within the body revealed the importance of integrated brain function and the possibilities available when this occurs. 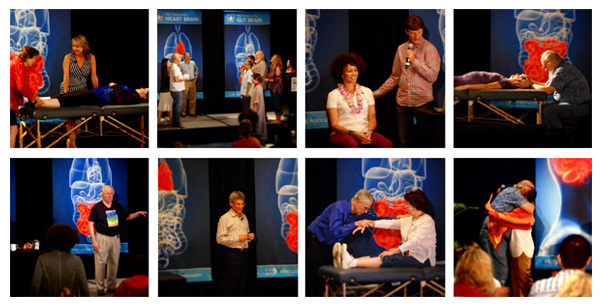 He graciously shared a very simple kinesiology tool for identifying loss of brain integration that can be used to demonstrate the before-and-after effects of healing sessions. A great gift to us as BodyTalkers. On Sunday afternoon, John came to the stage with a freshly stimulated mind. He firstly commented on the extremely high caliber quality of the lecturers and their respective subject areas. He joked about how his own teaching of the Three Heater when he was head of his acupuncture college was quite pitiful compared to Lonny's in-depth talk. Before talking more in-depth about how he saw the information from all the presentations tying together, he did make it clear that as much as he loves gadgets, his vision for BodyTalk has always been to develop an energy medicine modality that could heal people if he was stuck with them on a desert island with no other tools. The Conference ended with a Panel Discussion that included Charles, James, Lonny and John (Saturday's panel was Tracey, Paola and Howard). The audience asked some excellent questions spanning the topics of the heart, the soul, the three brains, as well as going deeper into some of the specifics from the lecture presentations. It was a joy to watch four of the greatest and most open minds of our day bouncing insights and ideas off one another in response to audience questions. We wish we'd had at least twice as much time for the panel. Alas, all good things must come to an end, and quite an end it was. The final activity of the day was a very moving handing out of Recognition Awards to some of our members and participants of the IBA who have gone above and beyond in the work they do (there is a list of Recognition recipients below); including a heartfelt shout-out to the tremendously successful efforts of the staff. The final award went to our steadfast leader, John, in Recognition and Appreciation for his Big Caring Heart and his Humorous, Loving, and Generous Soul. It was a truly wonderful Conference, but none of it would be if it were not for the dream, the vision, the dedication, and the creative power of John, and the constant wisdom, love and support of Esther. Let's offer them all our gratitude, heart and soul.